Brother Bayo introduced the Musgraves and called on several to greet them in their respective native languages. Brother John responded with appreciation for their warmth and hospitality. Remarks were then made by Gabriel Ajayi, the Anthony Regional Overseer, before a closing prayer was given by Rachel Fakorede, the WECA Director of Francophone Regional Services. Following a time of prayer around the altars, many young people gathered outside to see the Musgraves off to their hotel. They returned to Anthony Village the next day and met the WECA management team. Introductions were necessary as the work has recently been restructured with new members added. They also received a tour of several buildings on the Anthony Village campground, including the headquarters office, a newly renovated library, the church sanctuary, which was recently painted, the infrastructure management building, and the publishing building. They also toured a multi-purpose building, which was recently constructed in four months. They said it is a beautiful fellowship hall that seats up to 750 people. It is being used as a Sunday school station, but is also available for church and family events, such as wedding receptions. They noted that cabins on the ground, once used only during camp meeting, now house workers. Many of the Anthony Village workers have served for over forty years. About ninety percent of them are volunteers. They are both productive and happy. Following the tour, a meeting was held to review the WECA management restructuring. Brother John remarked afterward that the “the scope of the work as they manage hundreds of locations across the southern and into the central region of Nigeria is staggering. Many wear several hats and they do a tremendous job.” At the close, he thanked the team on behalf of the world headquarters for their dedication to the Gospel work. 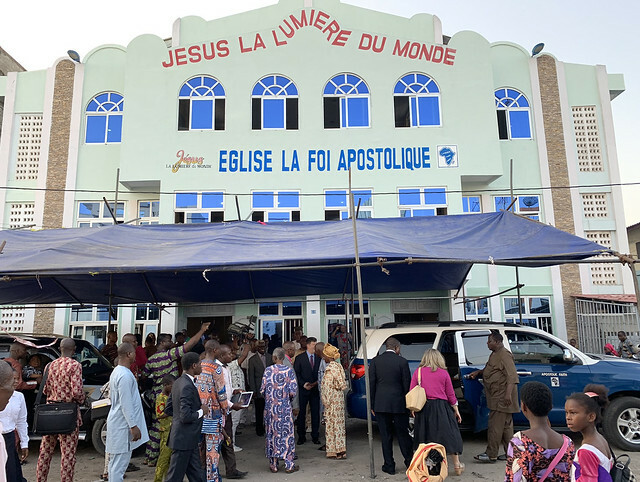 On Saturday, the Musgraves traveled to Cotonou, where our headquarters church for the Republic of Benin is located. At the airport, they were met by a large group of reporters taking photos and video. They answered questions while waiting for Brother Bayo and James Olaleye, the WECA Director of Administration, before continuing to the headquarters at Jericho Road. During the service, Brother Bayo gave a history and overview of the work in Benin. He also introduced Marcellin Hounmenou who was seated in the front row with his wife, Elise. Brother Marcellin is a pioneer of the Benin work who was responsible for translating much of the early literature. In 1997, he became the Jericho pastor and the country overseer for the Benin work. The service concluded with a congregational song, closing prayer, and time around the altars. Then the Musgraves had a tour of the building. It presently has three stories, but a fourth is under construction. The main sanctuary is on the first floor, and a U-shaped balcony makes up the second. Together, they have a capacity of about one thousand. The third floor is used as a general assembly area for Sunday school and also has several classrooms and a prayer room. The fourth floor is being completed for the purpose of transferring the French translation work (including the printing of Sunday school materials and other literature) to Benin, which has become the main francophone hub for WECA. On Sunday, March 25, the Musgraves joined the Jericho saints for Sunday school. Arriving a half hour before the start, they noted that the church was nearly filled to capacity. The choir opened the general assembly, and then the Sunday school children marched in singing a welcome song and gave a presentation. When it was time to dismiss the students to individual classes, there was no room to move about, so the lesson was taught by one teacher from the pulpit. At the close, the children remained in the department while the adults went to the sanctuary for the morning meeting. Brother John said that by that time, every floor of the building was filled with people, and about one hundred more were standing outside. The morning service began with an orchestra and choir prelude. The orchestra played several selections including “He Leadeth Me,” and then choir sang “God Save Africa.” The Musgraves commented that the music was very impressive. Though the whole service was translated from French into a native language and then into English, Brother John said it moved right along. At the close, the altars filled quickly and it was clear that at least one woman was seeking for salvation as several workers gathered around to encourage her. Later, it was reported that 1820 had been in attendance, and of those, seven received salvation, four were sanctified, four received the baptism of the Holy Ghost, twelve were re-anointed, and seven were healed. We praise God for the promises claimed and many victories won. The Musgraves are scheduled to travel to Ghana next for an evangelistic service, a building dedication, and a groundbreaking ceremony. We pray for continued blessings as they travel.